If you've seen the first Marvel "Avengers" (2012) movie directed by Joss Whedon then you might remember Robert Downy Jr's Iron Man, just coming-to after getting knocked out and still lying on the ground in his wrecked suit, mentioning that he'd like to try some shawarma (getting the idea because he saw a sign for the place while he was blasting through a Leviathan). "You ever try shawarma? There's a shawarma joint about two blocks from here. 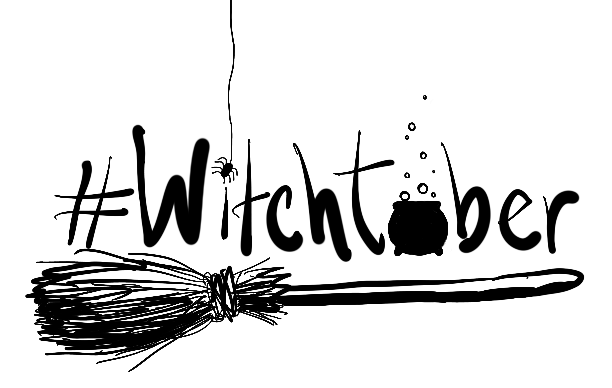 I don't know what it is, but I want to try it." 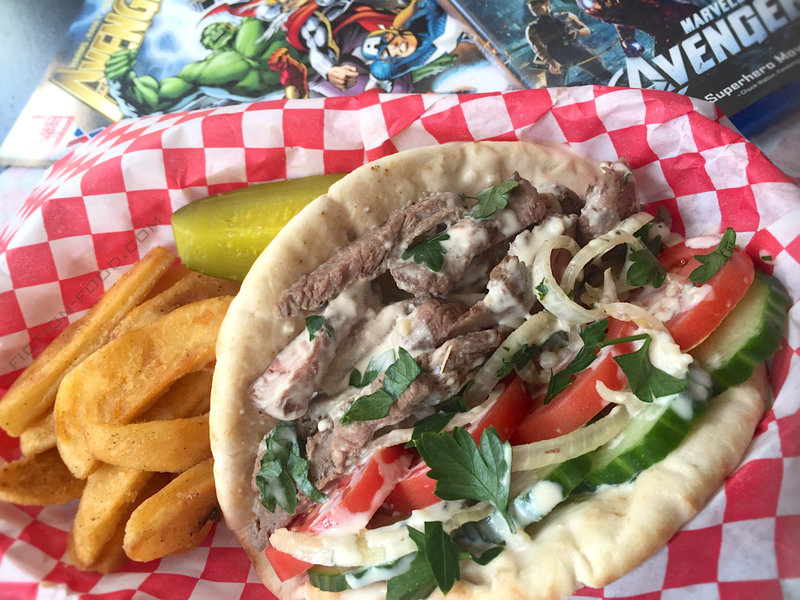 Shawarma is to the Middle East like hamburgers are to the US (or maybe burritos...). It's so common and in demand that it can be bought at restaurants and street vendors almost anywhere you go. Shawarma is a method of preparing meat, usually lamb or chicken, rotating vertically on a spit, slow roasting for hours, shaving off thin pieces as needed, but it also refers to the sandwich made with that meat. It's usually served on flat or pita bread with tomatoes, cucumber, maybe some onions, and often with fries and sometimes a pickle. Really anything you'd like to go on it. 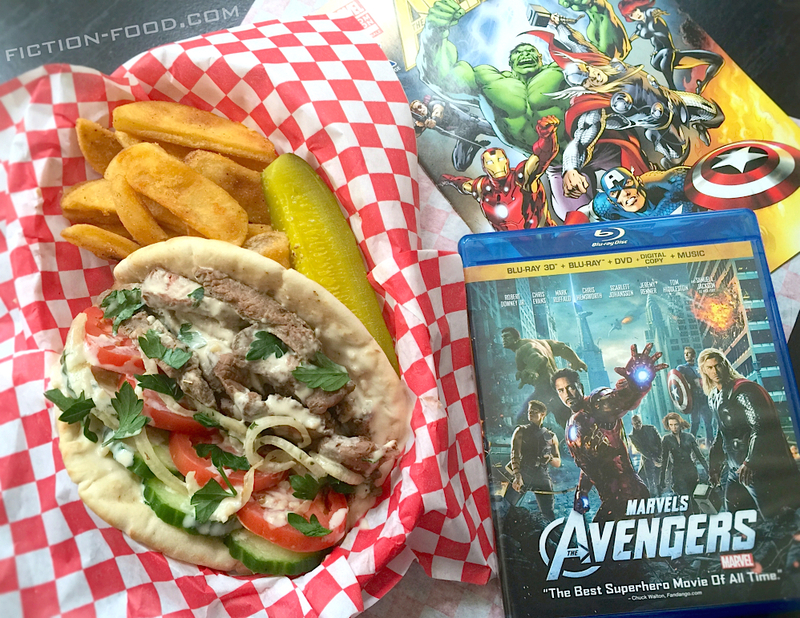 If you stayed through the end credits of "Avengers" you'll remember the special scene where the team does in fact sit down together and enjoy some shawarma in a place called Shawarma Palace (which is the name of a restaurant in Ontario, Canada, but the scene was apparently filmed at Elat Burger in LA). It's such a humorous addition to an action-packed movie because they don't talk, there's no background music, it's just them sitting around a table at this little battle damaged restaurant, eating their food in silence, just chillin' together and enjoying the food; the moment. In part two of the "Iron Man 3" Prelude comics, Rhodey (James Rhodes), in his War Machine suit, shows up at the restaurant after tracking Tony's location. Tony just waves him over and tells him to pull up a chair. Did you know that the whole shawarma thing is (most probably) a reference to an audition that Nicolas Brendan did for the role of Xander in Joss' cult fantastic TV series "Buffy the Vampire Slayer"? It's all thanks to shawarma that he got his role. Read the article here on CinemaBlend that includes a cast interview video clip where they discuss it–it's so random! Consequently, Brendan's character Xander mentions shawarma in season 1, episode 4 of "Buffy". Note: Apart from the meat you can pretty much put whatever you want on the sandwich. What I've listed below are just some common ingredients, but feel free to add or take away what you like! The meat recipe below is kind of a compilation/adaptation of this recipe on Allrecipes and this one on Mama's Lebanese Kitchen. 1. Meat: Slice the meat into 3-4" long chunks, trying to get them about 1/2" or so in thickness. Lay the meat pieces into the roasting pan. Whisk together the rest of the ingredients excluding the oil & pour over the meat, making sure the meat gets coated all over with it. Sprinkle the oil over it all & then cover the pan with plastic wrap (+ foil to help keep it closed if needed) & sit in the fridge 24 hours to marinate. 2. Pull the pan of meat out of the fridge & bring to room temperature. Heat your oven to 270ºF. Remove the plastic & cover the pan with foil. Place in the oven & roast for about 2 hours. Remove from the oven & heat up either an indoor or outdoor grill, or a hot frying pan. Sear the meat on both sides until browned & at least a little crispy, but this should only take a minute or two–you don't want to overcook the meat & make it dry! Place the meat in a serving dish covered with foil until ready to use. 3. Bake the fries as directed on the package (if needed, place the meat in the oven with the fries when the fries are almost done, but only if the meat is in an oven-safe dish!). Warm the pockets or flat bread in the microwave just until they are malleable (about 30 seconds for a couple) & then spread your preferred sauce onto the bread. Using the kitchen scissors, cut a couple of meat chunks into thin pieces & let those pieces fall onto the bread. Add a few tomato, cucumber, & onion slices, plus parsley, and even shove on some fries if you want. 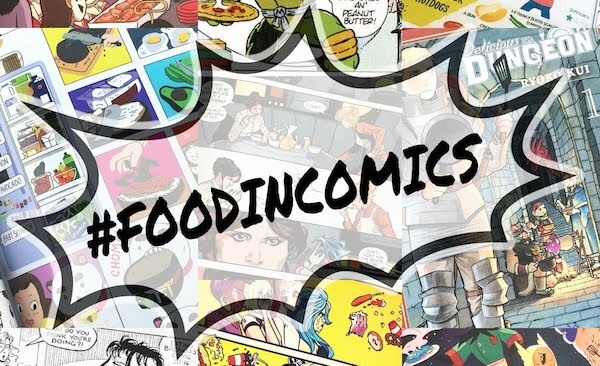 Sprinkle on any seasonings you may desire & then fold it up (unless you stuffed a pita, which is how Black Widow ate hers, well, and Thor too, but his was totally falling apart) & enjoy! Thank you! 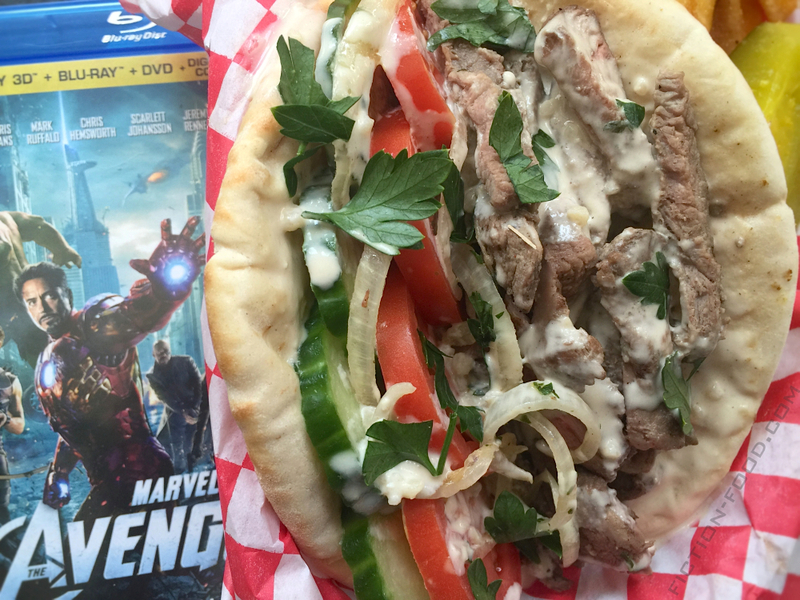 I've just seen The Avengers a couple of days ago and made a mental note to look up shawarma. Of course I forgot to, but thanks to your post I now know what it is.